Post by Nancy S. Marder, Professor of Law, Director of the Justice John Paul Stevens Jury Center, and Co-Director of the Institute for Law and the Humanities at IIT Chicago-Kent. Previously published on ISCOTUSnow. On November 2, 2015, the United States Supreme Court heard oral argument in Foster v. Chatman. The petitioner in this case, Timothy Tyrone Foster, asked the Court to decide whether the prosecutor exercised peremptory challenges based on race, in violation of an earlier Supreme Court precedent, Batson v. Kentucky. 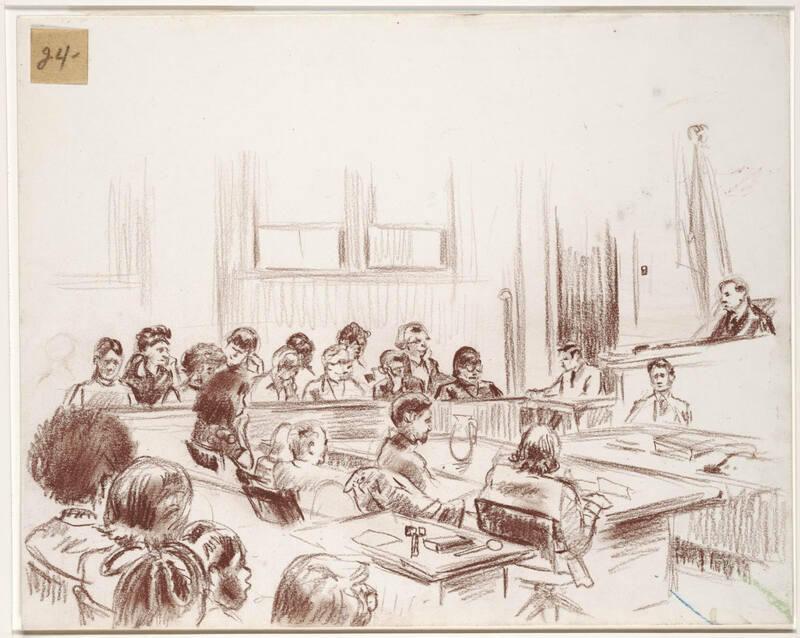 Peremptory challenges are allotted to both sides during jury selection so that they can remove a certain number of prospective jurors from the jury without having to give any reason at all. Batson, which was decided in 1986, established that peremptory challenges cannot be exercised by prosecutors against African-American prospective jurors if the defendant is African-American. Later Supreme Court cases expanded Batson and established that lawyers cannot exercise peremptory challenges based on the prospective juror’s race, ethnicity (Powers v. Ohio) or gender (J.E.B. v. Alabama ex rel. T.B. ), and these prohibitions apply to prosecutors and defendants (Georgia v. McCollum) in criminal cases, as well as to lawyers in civil cases (Edmonson v. Leesville Concrete Co., Inc.). Petitioner Timothy Tyrone Foster, an African-American man who has been on death row for the past twenty-eight years in Georgia, claimed that the prosecutors in his case violated Batson by exercising race-based peremptory challenges and striking four African-American prospective jurors during jury selection. Foster was tried, convicted, and sentenced to death by an all-white jury. Foster’s case provides an unusual window into the exercise of peremptory challenges and how prosecutors have managed to circumvent the proscriptions of Batson. When Foster objected to the prosecutors’ four peremptory challenges, the prosecutors gave seemingly race-neutral reasons for their challenges, which the trial judge and reviewing state courts accepted. However, years later Foster was able to obtain the prosecutors’ notes through the Georgia Open Records Act. The notes revealed that the prosecutors were working from a venire or panel list that highlighted in green those who were African-Americans, juror cards that indicated African-American prospective jurors by race, and a list of “definite no’s” that included the remaining African-American prospective jurors (after for cause challenges and hardship excuses had been exercised). 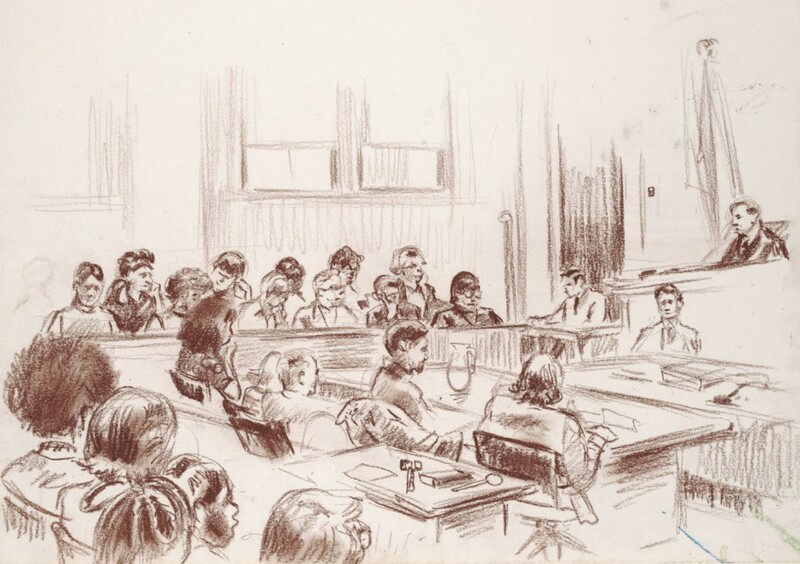 Although the prosecutors gave seemingly race-neutral reasons for the exercise of their peremptory challenges, their notes suggested that they considered race at every stage of jury selection. This is as close to a “smoking gun” as one is likely to find in a Batson challenge, unless the prosecutors had said outright that they had struck jurors based on their race, which no prosecutor would say after Batson. During oral argument at the U.S. Supreme Court, the lawyer for Georgia tried to explain the prosecutors’ notes by saying that they had to keep track of the prospective jurors’ race because the petitioner had filed a motion seeking to prevent the State from exercising peremptory challenges based on race. Several of the Justices, however, were skeptical of this reason because it was not advanced until Georgia filed its brief at the U.S. Supreme Court. The prosecutors had never made this argument in any of the courts below. One of the more surprising aspects of the oral argument was a procedural question about whether certiorari in this case should be directed to the Georgia Supreme Court, that had declined to issue a certificate of probable cause because it found Foster’s habeas appeal to be meritless, or whether it should be directed to the Superior Court of Butts County, Georgia that had considered and denied Foster’s habeas petition based on the newly discovered prosecutors’ notes. The Supreme Court had taken the highly unusual step of sending the parties a letter on the Friday (Oct. 30, 2015) before Monday’s oral argument (Nov. 2, 2015), letting them know that they needed to address this procedural issue. Each side spent almost 20 of its 30 minutes of oral argument on this issue. However, those in the courtroom on Monday—other than the Justices and both sides’ lawyers—had no idea why the lawyers were addressing this procedural issue rather than the merits of the case. 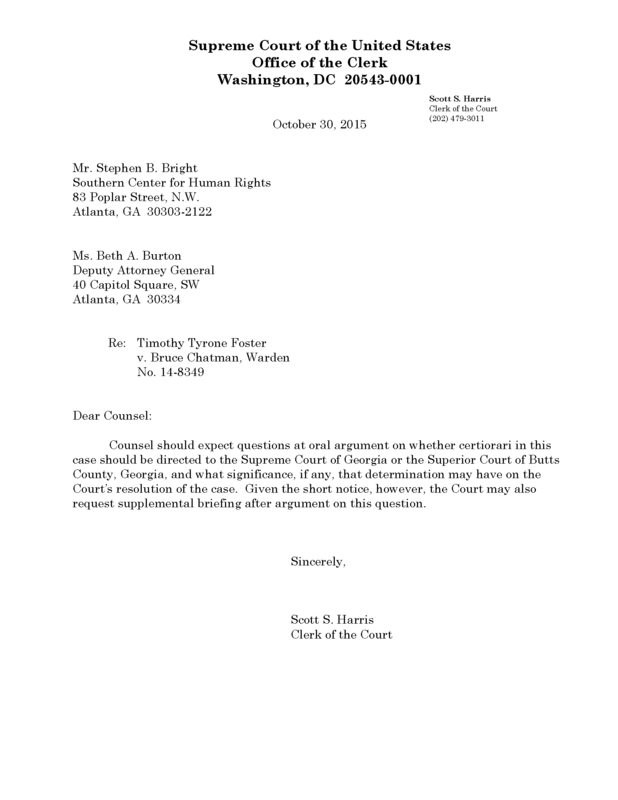 This procedural issue, which was not resolved at oral argument, might lead the U.S. Supreme Court to decline to reach the merits of this case, or to wait until after the Georgia Supreme Court or the Eleventh Circuit has weighed in on this issue. It would be unfortunate if the Supreme Court does not reach the merits of this case. Although it is notoriously difficult to show a Batson violation, in this case the prosecutors’ notes speak for themselves and show that the prosecutors’ peremptory challenges were based on the race of the prospective jurors. If the Court reaches the merits, there is a good chance it will hold that the prosecutors in this case violated Batson. However, if the Court is able to reach the merits, I believe it should go even further than Foster has requested and eliminate peremptory challenges. Peremptory challenges continue to serve as a mask for discrimination during jury selection. Justice Thurgood Marshall, in his concurrence in Batson thirty years ago, urged the Court to eliminate peremptory challenges in order to eliminate discrimination during jury selection. He wrote that as long as peremptory challenges were permitted, discrimination during jury selection would persist. Justice Marshall was right and thirty years of experience with Batson have proven his point. 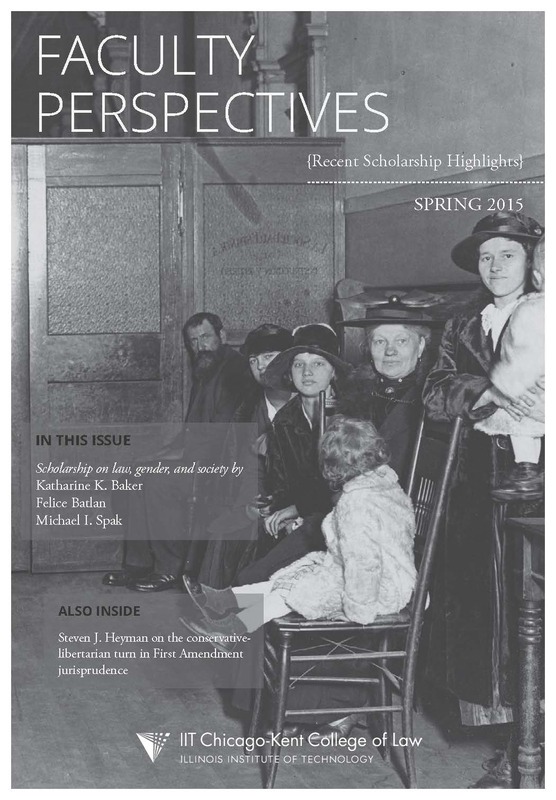 Read Nancy S. Marder’s article, “Foster v. Chatman: A Watershed Moment for Batson and the Peremptory Challenge?” on SSRN. This past week, Professor Joan Steinman’s “Spokeo, Where Shalt Thou Stand?” was included in Vanderbilt Law Review’s En Banc Roundtable discussing Spokeo, Inc v. Robins. Prof. Steinman joined IIT Chicago-Kent’s faculty in 1977, has served as interim dean, and has authored numerous articles on class actions, suits for money damages to vindicate First Amendment rights, and law of the case doctrine, among many others. “Spokeo” has such a Shakespearean sound that I felt compelled to ask a question worthy of the name: thus, “Where shalt thou stand?” This essay analyzes three distinct issues raised by Spokeo, Inc. v. Robins and considers where the Court will stand on each of them. First, I consider whether the Court will decide the question on which it granted certiorari: “[w]hether Congress may confer Article III standing upon a plaintiff who suffers no concrete harm, and who therefore could not otherwise invoke the jurisdiction of a federal court, by authorizing a private right of action based on a bare violation of a federal statute?” I explain why the Court might dismiss its writ of certiorari as improvidently granted. Second, I address whether Spokeo, Inc. or Robins has the better of the argument concerning Robins’ standing to sue. I opine that the Court’s decisions regarding standing in disputes concerning informational rights and wrongs indicate that it should find that the injury alleged by Robins is sufficiently concrete to confer Article III standing, and that Robins also satisfies prudential standing doctrines. Finally, I argue that the Court should not be dissuaded from so holding by the fact that the suit was brought as a class action. Read Prof. Steinman’s entire piece here. Visit Vanderbilt’s En Banc site for the whole Roundtable discussion.